I have been asked to give a picture of times past in the days of my youth in and around the hop fields. One morning, while driving from Portland to Eugene through the Willamette Valley, my thoughts turned to those days of harvesting hops, and our involvement. 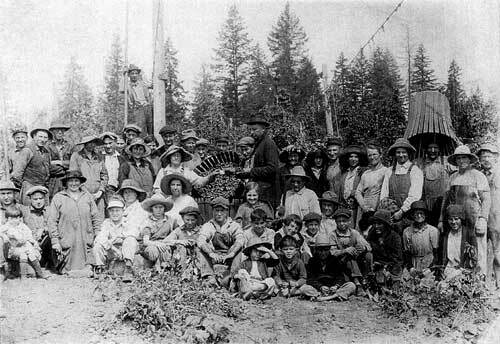 As I recall, notices of employment were sent out annually for pickers. Provisions were to be made for registration and transportation to the various hop fields designated. Upon receiving conformation of hiring and acceptance, a time period of picking up personal luggage for transportation to a railway station was made at a prescribed date. Now begins the exciting times of our trip to the valley. Volga Germans hop picking in the 1920s. Photographs courtesy of Kimberlee Henkel-Moody. The prescribed morning would arrive and we were taken to the Oregon Electric Railway Station. Upon arriving at the station, there were the cars, all bright and gleaming, awaiting the passengers from various neighborhoods, especially ours, at which time the order was given to load. We found our seats and settled down, awaiting the sound of the bell and the horn of the lead engine. 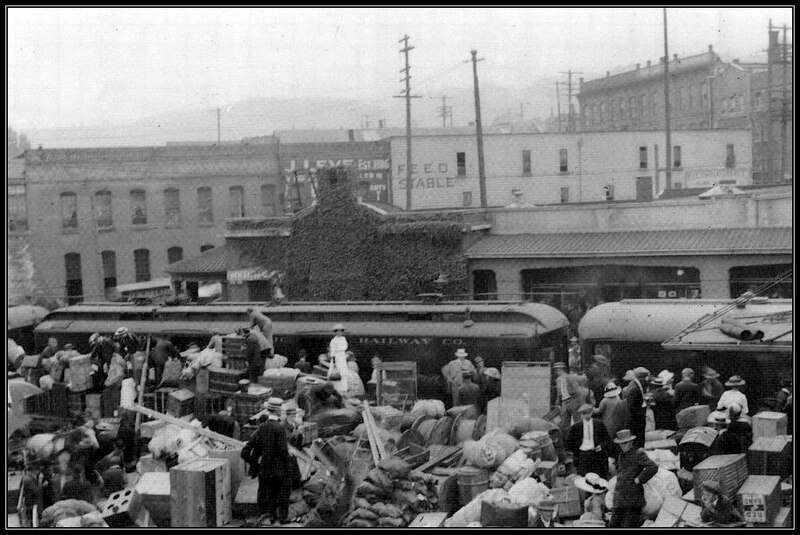 Hop pickers boarding Oregon Electric trains at the Jefferson Street terminal near Front Street, circa 1920. Posted on Portland History and Memories Facebook page. Source unknown. What an exciting feeling as the cars head south through the central West side of Portland and down to the main spur that was along the Willamette River and the southward bound through the valley, destination West Salem, Oregon. Upon arrival, we disembarked and boarded the various large flat bed wagons, moved by two horses each, to the many grounds at which we selected our (pardon the name given) “shanty’s”. Provisions were given, such as straw for large sheets to be filled for beds. The beds were just large enough for two, three, or four. Mornings would come and upon arousing we would eat breakfast and away we would go, walking if the field to be picked was nearby, and by wagon to more distant fields. Mornings were cool, but when noontime came we stopped for a bite of lunch that was always prepared before time. Afternoons were, at times, not as cool. Postcard of a Willamette Valley hop field from the collection of Steve Schreiber. Picking would begin from the bottom upwards until the hops at standing height were no longer available. At that time, voices shouting, “Wire down!” would be heard. 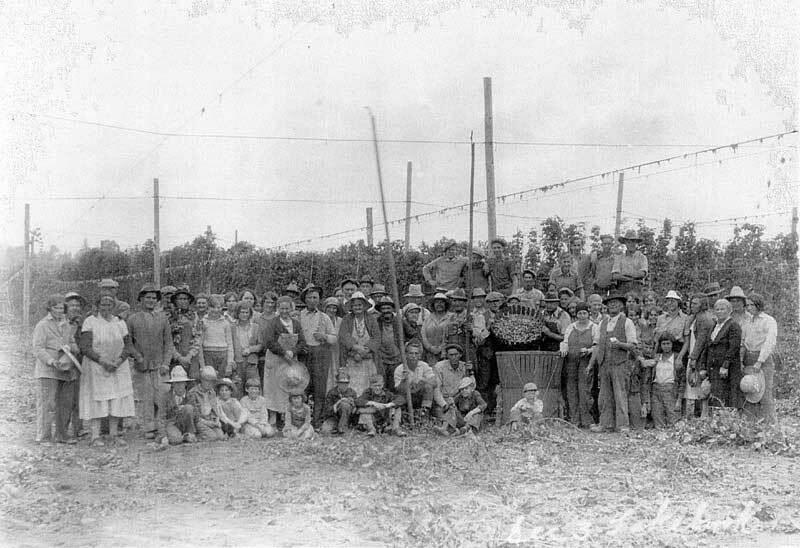 One or two men would arrive lowering the wire to clean the upper portions of the vine. I also recall the camps being somewhat near the Willamette River allowing us to go swimming as mother would give us permission, that is, after having picked five baskets up until noon time. Sanitation was also available such as the familiar chick-sales (outhouses), aroma to some, while to others horrendous. The time for picking usually consisted of three to four weeks. Some folks would hold out to the end while others would leave sooner due to the school hours lost from the day school began. The best of times were always had upon returning to our own home, which meant a return to our normal lifestyle and a comfortable bed. Written by Adam Bihn (May 1999) and used with his permission. Adam Bihn, Jr. was born in Portland on March 24, 1913 to Adam and Katherine Bihn. He was raised and educated there. Adam served the United States Army during World War Two and was stationed in Guam. On February 22, 1936 he married Helen Lind. His parents owned the Lincoln Park Grocery Store and Adam and his brother Donald operated the store after his parents died. He worked at the store until he retired at age 74. Mr. Bihn was a longtime member of the Word of Life Community Church (formerly the Evangelical Congregational Church which was originally known as the Second German Congregational Church). Adam Bihn, Jr. passed away on February 14, 2007 in Portland, Oregon at the age of 93 and he was buried at the Rose City Cemetery. He was preceded in death by his wife Helen in 1997.